The first type of public railed transport, the horse tramway, seems to have been sadly neglected by historians. 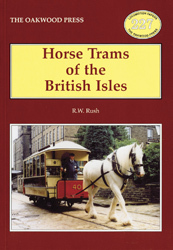 This is not intended to be a detailed history of all horse tramways, indeed such an attempt would be nigh impossible. It seeks only to trace the development from inception, well over a century ago, of horse tramways in general, and to compare some of the various designs of cars, and the firms who built them. A list of horse car systems in the British Isles is given as an Appendix, and is believed to be complete as far as the author can discover. A5 format, 104 pages, more than 50 illustrations, 23 of Mr Rush’s plans of horse trams reproduced to 4 mm scale.